Terrific corner location in Eastlake Trails. Three bedroom, with optional 1st floor 4th bedroom, 3 bathroom home with two car garage. Open concept living, dining rooms and kitchen with plenty of cabinet space, all appliances convey, walk-in pantry and an island. Newer tile flooring and brand new carpet. Living room has fireplace. Second floor has laundry room, Jack and Jill bedrooms with full bathroom, and spacious master bedroom with coved ceiling and master bathroom with separate tub/shower, dual sinks and walk-in closet. 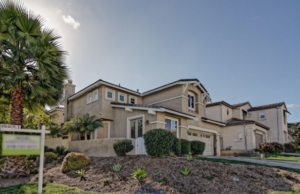 You will enjoy the many amenities this community has to offer, including an Olympic sized swimming pool, children’s pool, gorgeous clubhouse, and playgrounds throughout the community. Minutes from Salt Creek Elementary, Eastlake Middle School, and all the abundant shopping and leisure activities that Eastlake has to offer. Click here for more details, including additional photos of 950 Bryce Canyon.